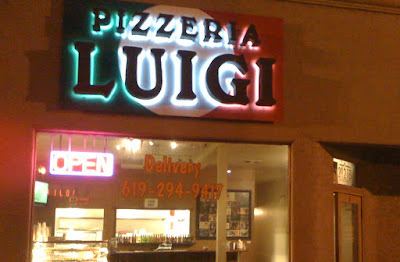 Pizzeria Luigi is a popular spot in San Diego for thin-crust New York style pizza. 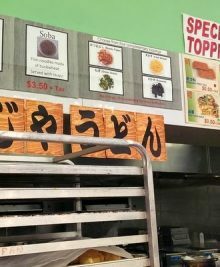 It’s been so successful that they now have two locations: one in Golden Hill and a newer one in North Park. When I first moved to San Diego, I was introduced to Bronx Pizza and immediately fell in love with the New York style pizza served there. So I really had no desire to check out other pizza joints for NY pizza. Pizzeria Luigi made its way to my radar a few years ago after seeing numerous yelp reviews and a segment on Guy Fieri’s show. I made plans several times to try it out, but I always ended up canceling those plans. This weekend, I was about to cancel them again, except that Future Husband (“FH”) insisted on pizza for dinner, so off we went. We chose to go to the North Park location. Since it is the newer location, I was hoping it’d be less crowded. I also hoped to go by Eclipse Chocolate for dessert, another place on my to-do list, but unfortunately Eclipse was already closed. The place was fairly empty when we arrived, allowing us to snag one of the big benches for our party of 8. 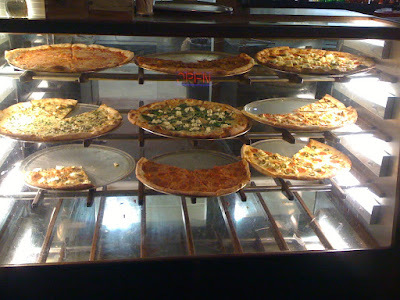 Various pizza pies are set forth in a glass display, allowing customers to choose a pre-made slice. Or you can order a whole pie. The first noticeable difference from Bronx that I observed was the service. Bronx has often been described to be serving NY pizza with a NY attitude. The people running Bronx tend to be brisk, abrupt, and intimidating to some. At Pizzeria Luigi, the guy taking our order patiently waited while I perused through a menu. After we ordered our pizzas and paid for them (cash only), we watched him go behind the kitchen and start tossing some pizza dough. The first pizza to arrive was a sausage, meatball and pepperoni pizza. We were given plates with the pizza, and the pizza man even took the time to pass out each plate to us individually. The pizza was sliced into 8 gigantic slices, a perfect amount for our party. I really liked the pizza here. The crust was thin, crispy, with just the right amount of chew needed for a New York style crust. The toppings were plentiful and the sauce didn’t soak the crust and make it soggy (a problem that often happens at Bronx). I also really enjoyed the flavor of the sauce and the spices added. Soon after our second pizza arrived: a white pizza with pesto and mushrooms and spinach. Again, I loved how plentiful the toppings were. This pizza was good, but not as good as the white ones I usually have at Bronx unfortunately. After two pizzas, some people wanted more, so we went ahead and ordered a third pie. This time we got a sauce pizza with mushrooms and sausage. Again, I loved the sauce on this pizza and the large chunks of sausage. All in all, everyone enjoyed the pizza here. I might have to go back to Bronx for my white pizza cravings, but Pizzeria Luigi will now definitely be one of my usual spots for New York style pizza. The laid back atmosphere, friendly customer service is a definite plus. It’s funny because I never did mind the customer service at Bronx and used to laugh when others complained. But after the great treatment at Pizzeria Luigi, I definitely see what I have been missing. If you want to check out some more delicious posts on Pizzeria Luigi, you can read some by CC of Pink Candles at Ridgemont High found here, here and here. i like both locations. the north park one is good because it’s right next to eclipse. i like the golden hill one too because they have a patio out in the back. although we didn’t order whole pizzas, we liked the variety of diff’t slices they had available, especially the one w/3 kinds of meat, the pesto, and the “white” pizza. oh my gosh, i am craving it now! 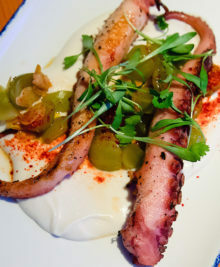 we still haven’t tried bronx yet because parkking really bites in hillcrest. one of these days, i will go! Hi CC. Your posts are really what motivated to finally get me there after having it on my to-do list for about 2 years now. Yeah the problem with Bronx is the parking. That’s why I don’t go as much as I’d like to. And I’ve tried ordering to-go, but it doesn’t taste as good. The crust isn’t as crispy as when you eat it there. Yeah I’ve never minded the Bronx service, but the nicer service at Pizzeria Luigi was a pleasant change. I think I prefer the white pizzas at Bronx but I like the sauce ones here better. My blog site is in the exact same niche as yours and my users would truly benefit from some of the information you provide here. I would need to know more details about how much you would be “quoting.” But I would prefer that you just link back rather than take any quotes from my posts. Thank you.